Oil-Electric: NW-2. What a History! Union Pacific 1000, Argo Yard, Seattle, December 13, 1959. Check out the "stove pipes" of this NW2! One of the identifying points, in a addition to the rounded cab windows and unique headlight. 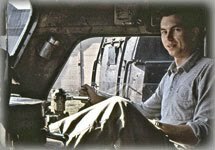 Most of UP’s goats had "Route of the Streamliners" on the cab. Then these signs started showing up - probably the brainchild of someone up at corporate! How does a yard crew "practice" perfect shipping? 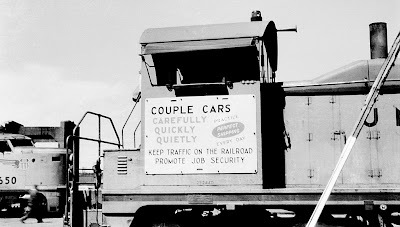 Union Pacific owned 95 of a total of 1,143 these 1,000 hp yard gophers, produced from 1939 through 1949, although WWII suspended production from 1942 to 1945. Railroad Stuff: Found this information on the UP 1000 on the UtahRails.net: UP 1000 was built as Electro Motive Corp. NW2 demonstrator 889; built October 1939, serial number 889, for demonstration service on UP; sold to UP March 1940. 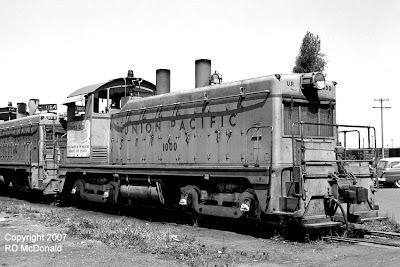 UP 1000 was sold to Stockton Terminal & Eastern Railroad 1000, Stockton, California, in July 1966; sold to WP in October 1968, rebuilt and placed in service as WP 607 in June 1969; sold to Sacramento Northern 607 in May 1973; assigned UP 1886 after December 1982 UP/WP merger but never carried that number. Retired again in September 1983 and donated to tourist operation Wasatch Mountain Railway, Heber, Utah in May 1984, delivered in early August 1984; repainted back to original UP black switcher paint scheme; sold to Nevada State Railroad Museum in February 1993, moved to Boulder, Nevada in 1994; repainted and re-lettered to Boulder City Southern; re-lettered to Nevada Southern.